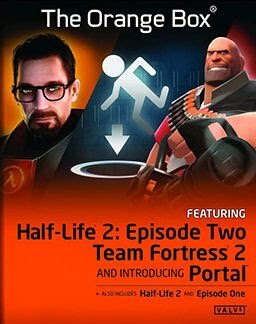 I was wondering if there was a way I could legitimately get awesome tracks from games like Portal, Half-Life and Team Fortress 2. I have heard about the Orange Box soundtrack before and checked it out. I discovered that Audiosurf, an game where you get to surf your music, actually comes with The Orange Box soundtrack included for free! Considering Audiosurf was cheap (USD$10), I thought this was too good an opportunity to miss. There are a lot of tracks to go through here but unfortunately most of them are pretty dull, depressing and ambient kind of stuff, especially when you listen to tracks from the Half-Life series, especially Half-Life 2 onwards. This is not to say the music is bad in itself and they probably work well within the game but they're not very listenable on your CD player. The best tracks within the Half-Life series are the grungy ones or ones with a rock influence to them. Song 11 on the Half-Life track is a good example (albeit a short one) and most people will recognise this as the Valve theme (the music that is played when the Valve logo is displayed when loading up one of their games). Others in a similar vein on the Half-Life 2 Episodes 1&2 soundtrack include "Abandoned In Place" which sounds like it belongs in a Jason Bourne action-flick, the epic "Hunting Party", "Vortal Combat" with the awesome bass riff and "What Kind of Hospital Is This". In terms of electronic music favourites in the Half-Life series, I would firstly pick the Half-Life Credits Track (Song 25); It's groovy and cool, in a nerdy kind of way, just like the silent protagonist of the series. Song 29 is one of my picks too, just for laughs as it sounds like the Vengaboys were hired to create this one! Out of the remaining tracks, namely Portal and Team Fortress 2, there aren't that much to pick from. Portal's soundtrack suffers from the same problem as the Half-Life soundtracks in that most of the music is ambient and not very entertaining to listen to on their own. The first track of "Subject Name Here" is a favourite however and epitomises the naivety some have with the brave world of science and it almost sounds like the music you'd play in a sparkly clean Harpic ad. Undoubtedly the best track on the soundtrack (and a favourite with many fans) is "Still Alive" which is played at the end of the game. In terms of the tracks for Team Fortress 2, I actually ended up liking all of them, even though there are sadly only four of them (there has been more released for the game since this soundtrack's release). The "Team Fortress 2 Theme" sounds like a mix of Austin Powers and the Batman TV show themes. You could almost believe you were watching a 60s cartoon TV show whilst listening to this one. "Playing with Danger" is also a wonderful spy music track used in the TF2 trailer along with the "Rocket Jump Waltz". Finally, "The Art of War" has some awesome drum beats and almost sounds like a Chinese Lion Dance. You get a lot of tracks here for only 10 bucks and it includes the fun game Audiosurf to boot (yes I know, people usually want the game rather than some random game soundtrack, but that's just me :)). There is a lot of detritus you have to sift through to find the juicy morsels, but they do exist. With a whopping 94 tracks on this album, there's definitely a lot of tracks to listen to here! For those interested in obtaining this album, buy Audiosurf off Steam. You will require a Steam account in order to purchase/download games.